Ceres' mysterious mountain Ahuna Mons is seen in this mosaic of images from NASA's Dawn spacecraft. 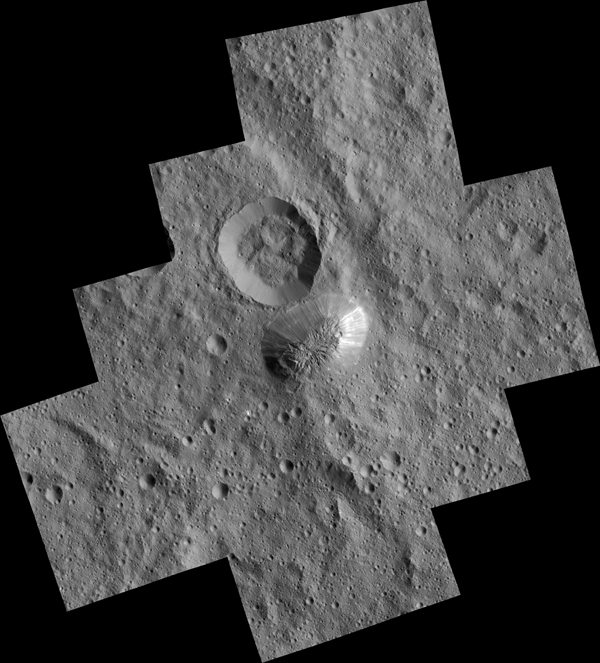 Dawn took these images from its low-altitude mapping orbit, 240 miles (385 kilometers) above the surface, in December 2015. The resolution of the component images is 120 feet (35 meters) per pixel. On its steepest side, this mountain is about 3 miles (5 kilometers) high. Its average overall height is 2.5 miles (4 kilometers). These figures are slightly lower than what scientists estimated from Dawn's higher orbits because researchers now have a better sense of Ceres' topography. The diameter of the mountain is about 12 miles (20 kilometers). Researchers are exploring the processes that could have led to this feature's formation.